This year, Christmas preparations have taken a weird turn. I couldn’t wait for the holidays to start but neither my office nor my home reflect that Christmas is in less than two days. BUT I have been really busy making things instead. 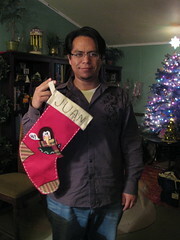 This year, we made our own stockings. We purchased felt and embroidery floss and went to town. 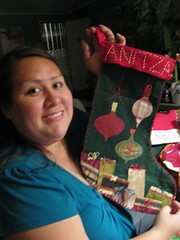 We even made them for the rest of the family that wasn’t partaking in the craftiness and my in-laws as well. I also designed my cards, a little late (and they were printed SUPER late by the company I chose, only got them today – thank goodness I ordered overnight!). So to those of you that are getting a card, I am sorry it is so late! I also underestimated the list so I had to trim my nebulous list in my head when I sat down to address them. Next year I am making a damn list ahead of time. This famed "Christmas list" that white people like to talk about ;), I am making my own. 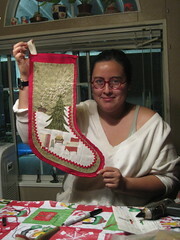 Oh, and this year, I made some scrumptious crafts too! I made Christmas tree lollipops with pretzels as sticks and some super yummy Oreo truffle lollipops as well. I will post pics of those hopefully tonight or tomorrow. Anyway, the holiday season has been really good to us so far. At work, I’ve had a great time. We went on our annual holiday lunch, this time to the Museum of Latin American Art and had a great time. Coworkers have been giving me splendid gifts that have won out on my resolve so I’ve been bad and have opened every single one of them. A highlight is Andrew’s photo which he printed and framed for me. It was my favorite of his this year. The anticipation of Christmas kills me. I want people to open up their presents already! 😀 Just one more day and they will all be opened! Oh, I almost forgot, I also made a super cool gift for the family, but I can’t post about it until after because kaptainsnot is on LJ, and for the one or two of you out there that wasn’t paying attention, she’s my sister. 😉 But I will certainly post photos when I can! 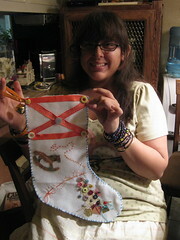 One Response to "Being Crafty"
Hope you have a merry, jolly Christmas!